On behalf of the White House Initiative on Historically Black Colleges and Universities, we wish to thank all the attendees, exhibitors, conference donors, presenters, guest speakers, volunteers, and many others for joining us at the 2018 HBCU Week Conference, HBCU Competitiveness: Aligning Institutional Missions with America’s Priorities. Seats will fill up fast, so those wishing to attend should register now. 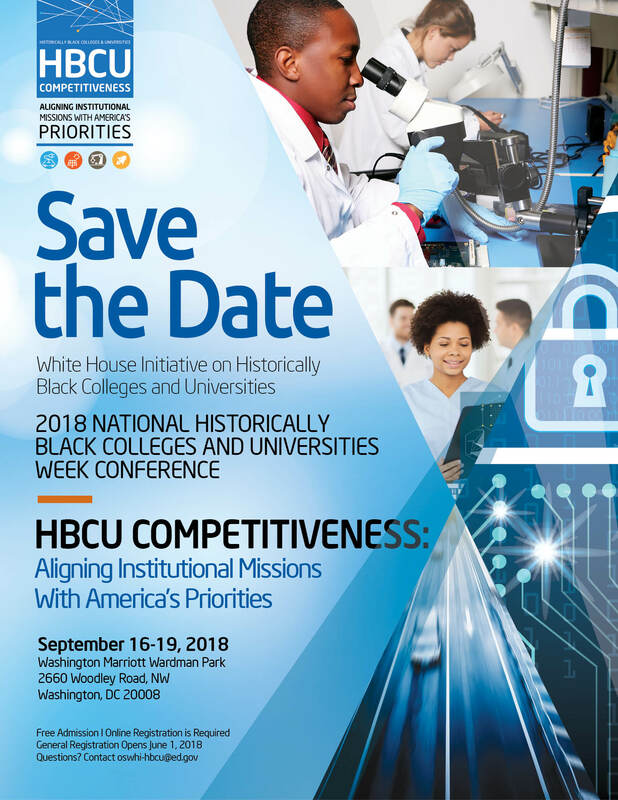 The conference is open to all HBCU Presidents, Chancellors, senior administrators, HBCU students, sponsored programs professionals, student financial aid executives, higher education advocates, members of the President’s Board of Advisors on HBCUs, trustees, alumni, corporate, foundation and government officials and other professionals. This is the HBCU conference you don’t want to miss. We hope to see you in September. 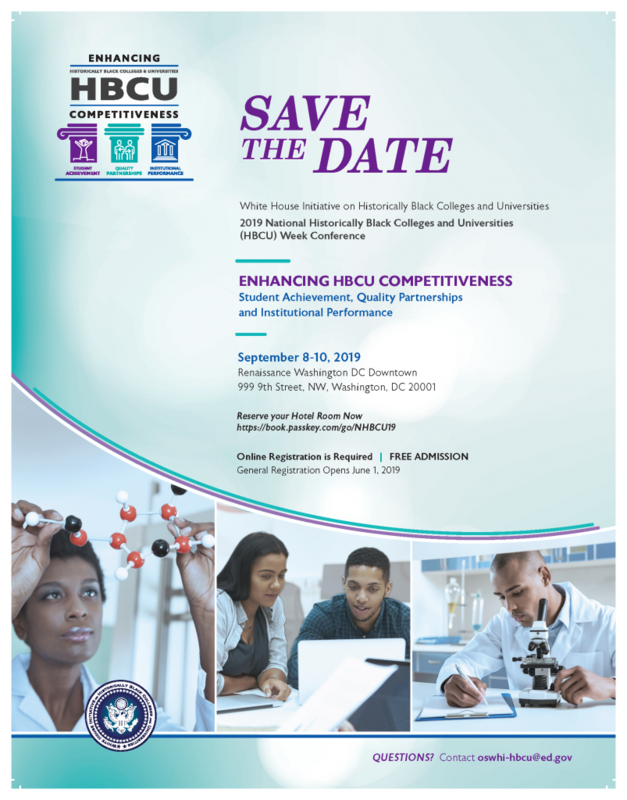 The White House Initiative on Historically Black Colleges and Universities (WHIHBCU) is excited to announce the launch of HBCU Competitiveness Scholars, a student recognition program designed to honor current HBCU students for their competitiveness, i.e., successfully preparing to compete for top opportunities that improve standards of living in their communities. For the specified academic school year, Scholars will serve as representatives of their respective institutions and communities to the WHIHBCU. The WHIHBCU will provide outreach and engagement opportunities for Scholars as well as information and resources to disseminate among their fellow students. Scholars will participate in regional events, webinars; and monthly web chats with the WHIHBCU staff and other professionals from a wide range of disciplines. Scholars also will have opportunities to engage with one another to showcase individual and collective talent across the HBCU spectrum. To inform their experience, Scholars are expected to carefully assess their personal and career aspirations, as well as the needs of their institutions and communities, to help determine the best ways the WHIHBCU and its partners might provide support. It is essential that the WHIHBCU engage the next generation of leaders who are expected to make meaningful contributions to society. Their growth and development are crucial to the success of our communities, our nation and our global competitiveness. The Annual National Historically Black Colleges and Universities (HBCUs) Week Conference is planned under the leadership of the White House Initiative on HBCUs and with input from the President’s Board of Advisors on HBCUs and its conference sponsors. It provides a forum to exchange information and share innovations among and between institutions. You Do Not Want to Miss This One…Lock in your hotel now! During this season of giving thanks, I reflect on my gratitude list – a wonderful family, good health, great friends and new adventures. Also, I count the Historically Black Colleges and Universities (HBCUs) on my list. Over generations and still today, these institutions open the doors of opportunity to so many. I am grateful for the chance to work with our nation’s HBCUs – urban and rural, two and four year, research campuses and teaching focused institutions – that educate more than 300,000 students annually. True to their mission, they focus on building diverse leaders equipped and committed to improving our nation. Our HBCU graduates continue to make their mark across multiple fields including as innovators, educators, doctors, civil rights champions and true advocates for children. In this year, I have witnessed HBCUs answering our nation’s call. As President Obama challenged institutions across the country to produce a million more STEM graduates, HBCU leaders joined with industry leaders at Tuskegee University to talk through recruitment, retention and work placement for STEM students – taking on the challenges and taking through the most promising solutions. When the U.S. Department of Education issued a call for innovative education practices focused on student success among low income students, campuses like Spelman College and Delaware State University were selected through a competitive process to advance this important work. And when we sought partners to implement our Pell grant experiments in high school dual enrollment and prison education, again, HBCUs like Jackson State, Benedict College, Wiley College, Langston University, and Shorter College were among the campuses that raised their hand to serve students and measure success. 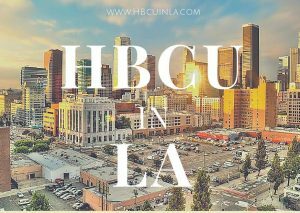 Our HBCUs have been a vital component of America’s social fabric for over 150 years. They have had a glorious past, but it is up to us to ensure that they have a glorious future. To support that vision, the White House Initiative on HBCUs is working to build the capacity of these institutions. We are expanding access to best and promising practices to lift student success. We are working directly with campuses and federal partners to promote their research capacity to engage in competitive federal contracts and we have reached out to federal and business partners to build pathways to employment through internship opportunities for our talented HBCU students, including emerging opportunities with the technology and entertainment industries. We are also in our third year of our HBCU All-Star program, which opens additional doors of opportunity to students who have been recognized for their academic, leadership and service commitment, giving them the ability to advocate for education and completion. That HBCU Pride was on full display last month when campus leaders, our HBCU All-Stars and federal and business partners gathered for the National HBCU Week conference. During our time together, we explored challenging issues like race, law enforcement and education justice; discussed access, affordability and completion; talked about student mobilization through a dynamic student and celebrity panel; and planned for deeper service and international student engagement. Talent development in this country is foundational for our democracy and transformative for our students. So in this season for giving thanks, I am grateful our HBCUs are educating, serving and answering our nation’s call as bellwethers for change developing new leaders. Phyliss Craig-Taylor is Dean of North Carolina Central School of Law. Prior to this, she served as an associate dean of academics at North Carolina Central School of Law. Ms. Craig-Taylor served as a faculty member at the University of Tennessee, the University of Florida, North Carolina Central University, as well as a visiting scholar at the University of Warsaw Center for American Law. She became a member of the Coalition for Racial and Ethnic Justice for the American Bar Association in 2015 and she was appointed by the Chief Justice of the North Carolina Supreme Court to serve on the North Carolina Commission for the Administration of Law and Justice. Ms. Craig-Taylor is a past Vice President of the North Carolina Bar Association and a past member of both the Council for the American Bar Association Section of Litigation and the Ethics Advisory Committee of the North Carolina State Bar. Before entering academia, she spent several years in private practice and served as a law clerk to the Alabama Supreme Court. Ms. Craig- Taylor received a B.A. and J.D. from the University of Alabama and an L.L.M. from Columbia University. Marian Wright Edelman is President of the Children’s Defense Fund (CDF), a position she has held since co-founding CDF in 1973. From 1971 to 1973, she served as Director of the Center for Law and Education at Harvard University. From 1968 to 1973, Ms. Edelman worked as a Field Foundation Fellow and Founder of the Washington Research Project of the Southern Center for Public Policy. In 1968, Ms. Edelman was a Congressional and Federal Agency Liaison for the Poor People’s Campaign. From 1964 to 1968, Ms. Edelman served as the Director of the Jackson, Mississippi chapter of the NAACP Legal Defense and Educational Fund. Earlier in her career, she served as a Staff Attorney for the NAACP Legal Defense and Educational Fund in New York. Ms. Edelman received a B.A. from Spelman College and an LL.B. from Yale Law School. Dr. Lillian Lowery is President and CEO of FutureReady Columbus, a position she has held since September 2015. Dr. Lowery served as a member of the President’s Advisory Council on Financial Capability for Young Americans from 2014 to 2015. From 2012 to 2015, she served as Superintendent of the Maryland State Department of Education. From 2009 to 2012, Dr. Lowery was Secretary of Education for the State of Delaware and from 2006 and 2009, she was Superintendent of the Christina School District in New Castle County, Delaware. Dr. Lowery was the Assistant Superintendent of Cluster VII for Fairfax County Public Schools in Virginia from 2004 to 2006. She also served for two years as an Area Administrator for Fort Wayne Community Schools in Fort Wayne, Indiana. Dr. Lowery began her career as a middle school teacher in the North Carolina Public Schools, where she worked from 1978 to 1984. Dr. Lowery has held leadership positions on the Board of Directors of Boys and Girls Club of America and Stop Child Abuse and Neglect. Dr. Lowery received a B.A. from North Carolina Central University, an M.A. from The University of North Carolina, and an Ed.D. from Virginia Polytechnic Institute and State University.